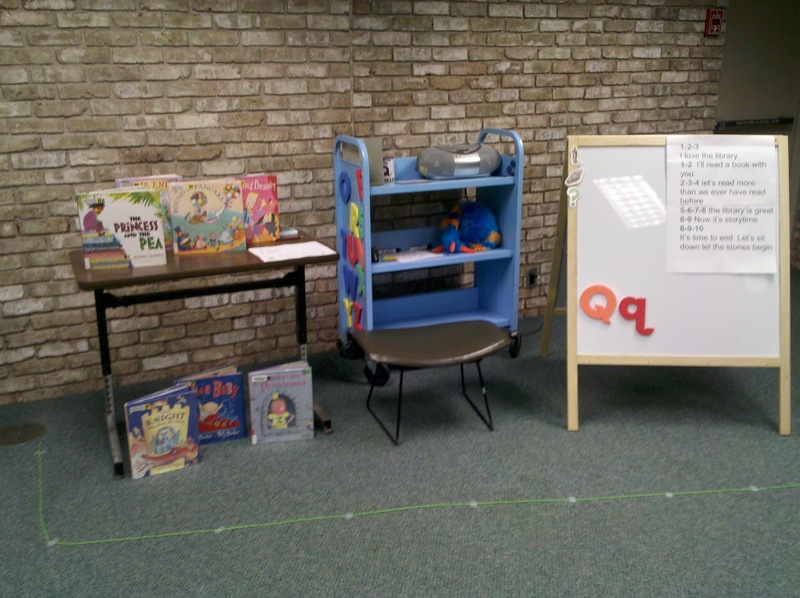 Speaking of things I've been sitting on for a while, today I'm sharing my Storytime set-up routine. I have already posted about choosing books for storytime, and I have another post coming about how I put everything together. 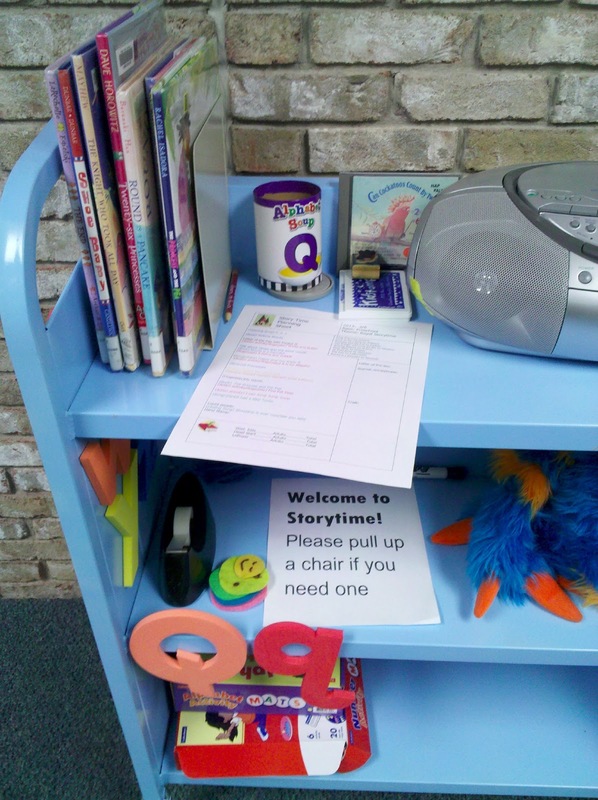 Anne at So Tomorrow provides the kick-in-the-pants I needed to actually share this post, due to her fab post on how SHE sets up her storytime. Lisa also accepted the gauntlet Anne threw down and posted her process. Once I have my storytime mapped out, I load up all my books and supplies on my Storytime Cart. Yes, this is a cart that I spray-painted. No, this is not a project that I recommend. 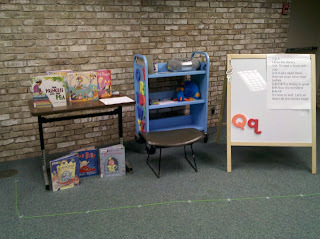 I wheel it into the program room and get set up about a half hour before storytime begins. I do not have a storage area in my program room, so the cart is crucial. Books for this week's storytime. Alphabet Soup Can with the letter of the day. Hand stamp and ink--usually ties in with theme, but might be "I love to read" type stamp. CD of the month--I highlight one CD in our collection by playing it before storytime for a few weeks at a time. CD player that stays on the cart permanently. 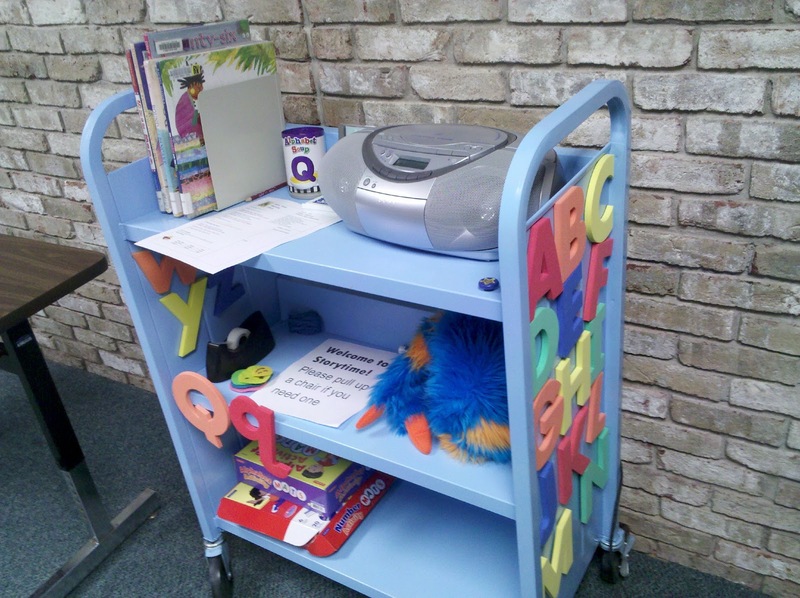 Magnetic upper and lower case foam letters, which are stuck all over the cart in order. Tape which I use to stick up the prompts for the letter of the day, hang signs, etc. Not pictured: masking tape I used to create the 'magic tape line' so kids don't sit in my lap. Felt pieces, which I will use on the easel (Five in the Bed). This is how I normally set everything up. I invite families to take the books after storytime, so I usually have quite a few extras. The easel is magnetic on one side, and that's the side we mainly use. I make posters of song lyrics and tape them up on the easel for those who can read. Often if I'm doing a flannel story I use a lap board, but if we're doing a larger flannel activity I just turn the whole easel around after the letter of the day. This is what people see upon entering the room. I play music 15-20 minutes before storytime starts, which makes the room nice and welcoming as people get settled. Stopping the music once I'm ready to start storytime also creates a noticeable 'break' in the noise of the room--everyone notices when the music stops, so I don't have to work as hard to capture everyone's attention to begin. I change the message on the white board to whatever is relevant that week. The kids love choosing their circle mats, and it encourages families to sit together on the floor (in the front!). There are about 15-20 chairs lining the wall to the right, and I don't move or set up any additional chairs. After we sing our closing song, I invite kids to come forward and get a stamp and tell families they are welcome to take the books. Most everyone puts away their circle mat and it only takes me a few minutes to completely clean up. Who else wants to share their storytime process? You can read about how I choose books for storytime here. I think this is such a great idea. I love how handy everything is! Hi Anna! I love your circle mats, and had a question or two about them. 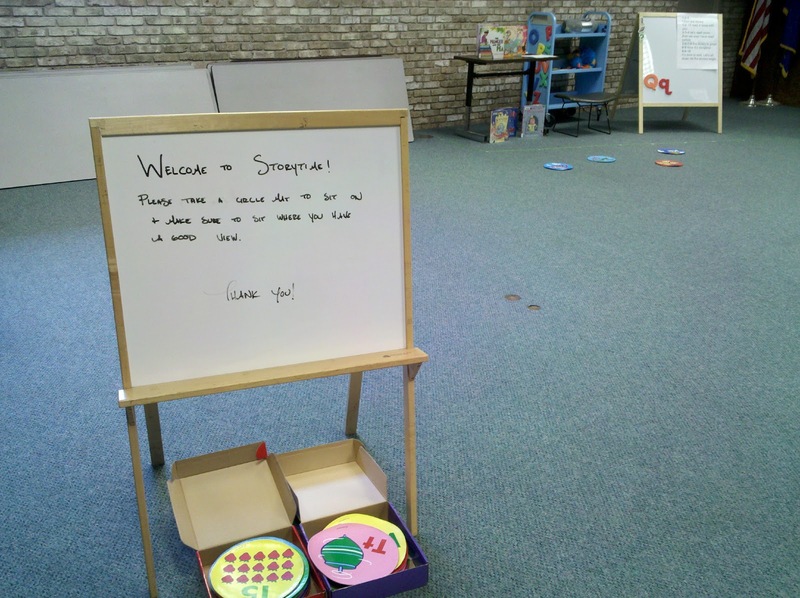 How do you handle your movement activities with the mats being on the floor at the children's feet? Do you have any tips on how to minimize the risk of a child slipping on them? I think these would come in handy when I have a large special storytime with visiting daycares groups who are still learning cross-cross applesauce. Thanks!